Bird's® is the original custard brand, established in 1837 and loved by generations ever since. Bird's Custard is made and served in millions of homes where proper custard is at the heart of a good pud! Store in a cool, dry place., Once made up, store in a refrigerator and treat as fresh food., For best before end see side of pack. 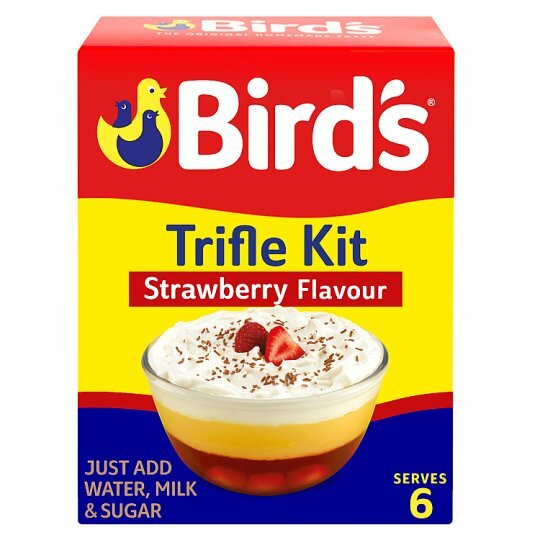 The perfect Bird's Trifle in a few easy steps! 1 Make jelly and leave to cool for 10 minutes. 2 Make custard and leave to cool until jelly has set. 3 Break each sponge finger into 4 pieces, place in a serving dish and cover with the cooled jelly. Refrigerate for 30 - 40 mins. 4 Spoon cooled custard over the surface of the jelly and leave to cool completely. 5 Make the topping, swirl over the cooled trifle and scatter the chocolate sprinkles over the top. Use skimmed, semi-skimmed, whole, coconut or almond milk to make your perfect custard. Vary the milk quantity in the custard and/or topping for your desired consistency. Add more or less sugar to suit your taste. Add fresh fruit of your choice* with the sponge fingers before adding the jelly. Top with sliced fruit or grate a little more chocolate over the top. *NB adding fresh kiwi, pineapple or papaya will prevent the jelly from setting.